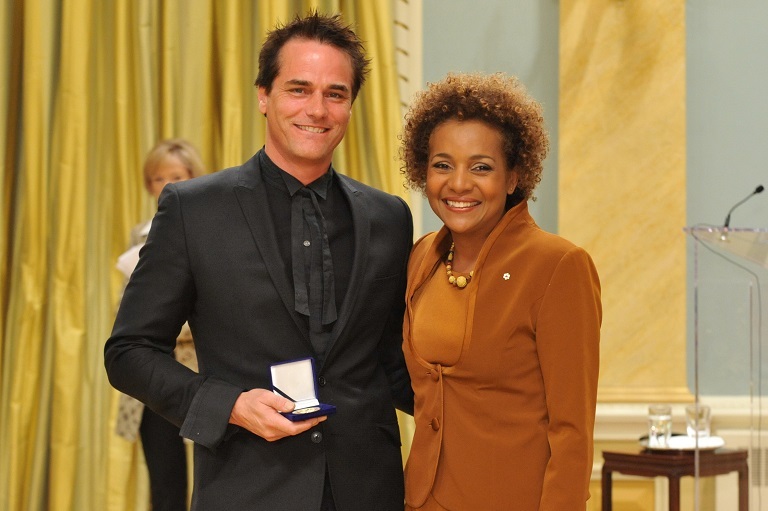 Paul Gross accepting his award at Rideau Hall, 2009. Fascinated with storytelling, individual experience, and Canadian symbols, Paul Gross, actor, filmmaker, screenwriter, in his multiple works, has been single-minded in highlighting subjects from the Canadian past and in making them informative and accessible. His films, he argues, are not made for critics or film festivals: “I make films for the people who actually pay for it." Born in Alberta, Paul Gross grew up as an army brat on bases in Canada and Europe and took a degree in drama at the University of Alberta. As a young actor and writer in the 1980s and early 1990s, he was playwright in residence at the Stratford Festival and played Hamlet. Stardom came as RCMP officer Benton Fraser in the television series Due South (1994-98) and then as the more dubious Mountie in Murder Most Likely. He established his directing reputation with the 2002 comedy, Men with Brooms, capturing in this film the meaning of curling, the masculine psyche, and the relationship between nation and culture. Inspired by stories from his grandfather, Michael Dunn, a survivor of the 1917 battle, the film tells the story of a wounded survivor of Vimy Ridge who returns to Calgary as a recruiter only to head back to the front at Passchendaele with the 10th Battalion of the Canadian Army. The historical accuracy of uniforms, weapons, trenches, and health stations are outstanding: the battle scenes are breathtaking and horrific in their ugliness and violence. The film is only one part of Gross’ mission to demonstrate “the power that storytelling has on our nation's psyche.” Some of the profits from the film are to be directed to the Canadian Museum for Human Rights. Most important, the film forms part of a larger campaign to teach about war and military history in Canadian schools. Paul Gross’s distinguished and varied career of popularizing Canadian history, his award-winning film Passchendaele, and his determination to “re-ignite interest and pride in Canada’s military history” make him a fitting recipient of the 2009 Pierre Berton award.